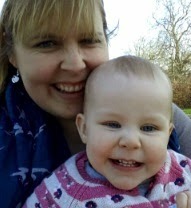 Hi, I'm Aby and I blog over at You Baby Me Mummy. I was born in Cheshire, but lived in Scotland for seven years. I now live on the Hampshire/Berkshire border. We have one daughter, 'Baby', who is a feisty 15 months old. I started to think about it when I passed 30, but I wasn't ready to give up riding, horses and competing. Then a few years ago it became all consuming and I knew it was what I wanted most in the world. I don't think I have one favourite moment. I love it when I get smiles, cuddles and kisses. I also love it when she is so thrilled she has learned something. Just being the one person that makes someone else's world better. Nothing that I know now would have put me off wanting to be a mum. We could never prepare the bottles according to NHS guidelines and so we wasted so much money on ready prepared milk (as we fed on demand). I wish someone had told us earlier that there are other (perfectly good) ways to prepare bottles, which will be easier. 7. What were the top things you had for your baby that you would recommend to other mums? Angel Care movement monitor - literally could not live without it. 8. What things could you have done without? At the moment I am a SAHM and blogger. Being with my daughter everyday and watching her grow. Sharing the special moments and making memories as a family. You Baby Me Mummy is a Parenting & Lifestyle blog. I blog about our family, our daughter growing up and anything else that takes my fancy. There are so many things! Probably the community. The blogging community is far and away the most supportive group of people I have ever met. I also love having a creative outlet, committing our memories, being involved in exciting projects and lots more!